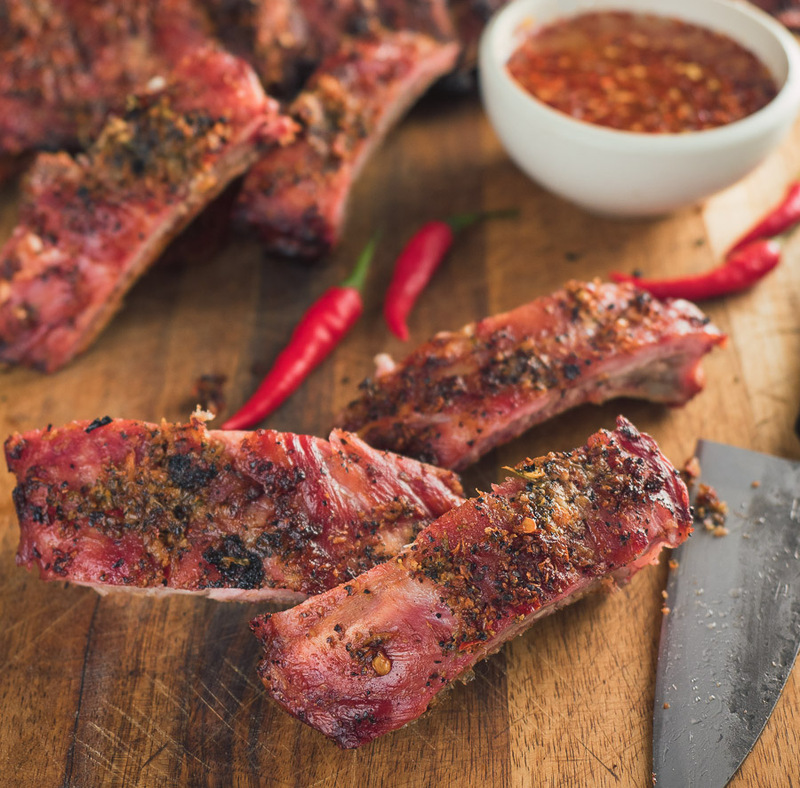 If you love ribs you need to try Thai ribs with hot and sweet dipping sauce. Big bold Thai flavours. 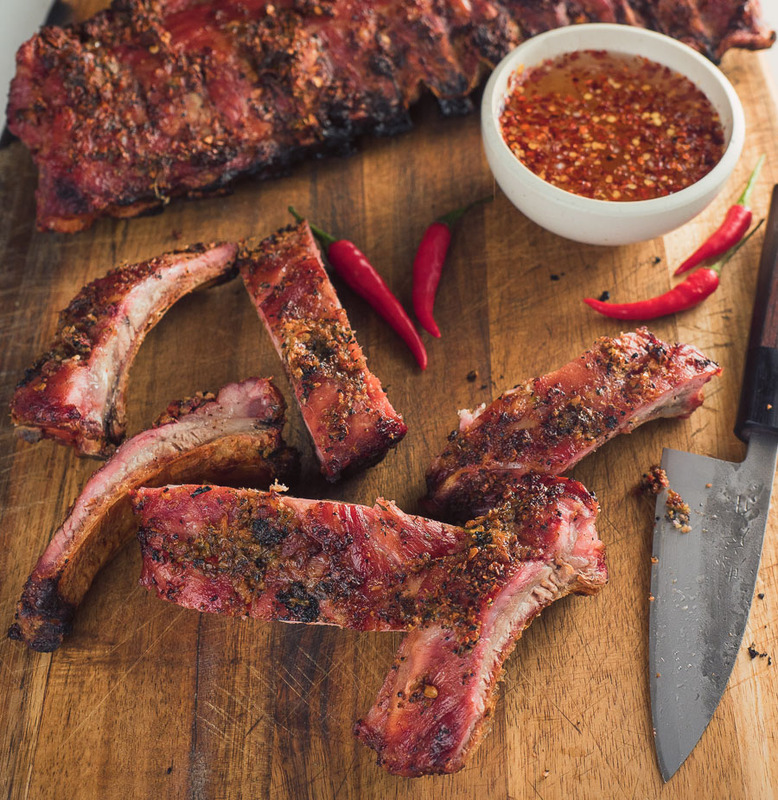 These are ribs that will make you wonder why you ever thought ribs need BBQ sauce. I love pork. I love pork ribs. Low and slow BBQ ribs are a wonderful thing. But they aren’t the only thing. That’s what I don’t get. Why limit yourself? Do you know more than one way to cook chicken? Is there only one way to prepare fish? And yet when you think about ribs you only go to one place? How does that make any sense? This is different. Thai flavours. Dipping sauce instead of BBQ sauce. Grilled, not smoked. But the result. Delicious ribs. Something new. Something good. The dipping sauce is a mix of hot from chili flakes and sambal oelek. Don’t know sambal oelek? It’s a better sriracha. Try it. Or don’t. It’s optional. A little rice vinegar for tang and sugar for sweet. Simple. But unexpected. The ribs get what amounts to a wet rub treatment. Big south East Asian flavours. Bold but not overpowering. A little cilantro. Some fish sauce. Garlic. A bit of chili. And a good dose of coarse black pepper. I like butcher’s grind if you can get it. Awesome here. And awesome for classic Texas BBQ. Just works. The only other thing to think about is internal temperature. BBQ – any BBQ – is about getting the meat to the point where the collagen melts and everything gets moist. Fall short and the meat is overcooked. Overshoot and you lose the magic of the collagen. Nail it and everything works. Get an instant read thermometer. The pros use them. There’s a reason. Its cooking science. These are not the famous Pok Pok ribs. Those ribs are crazy good too. But you really need a smoker to pull them off. These are easier. Faster. And they are still wicked good. 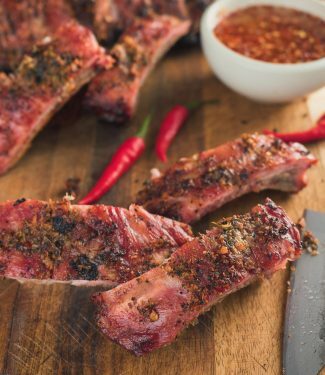 Thai ribs with hot and sweet dipping sauce bring the tastes of Southeast Asia to your table. Ribs don't have to mean drowned with BBQ sauce. 4-5 Tbsp cilantro roots and lower stalks - if you can't get roots just use stalks. Combine all the rub ingredients together in a food processor and pulse until you have a coarse paste. This may take scraping the bowl a fair bit to get it all to work if your food processor is large. Alternately, crush the dry ingredients together in a mortar and pestle, then combine with the fish sauce. Coat the top of the ribs with the rub and let stand one hour at room temperature or up to four hours in the refrigerator. While the ribs marinate pre-heat your grill to about 350F. Charcoal is best but if you are using a gas grill add some wood chips if you can. A bit of smoke is great here. Grill the ribs until you reach an internal temperature of 190F. This will take one to one and half hours depending on how meaty your ribs are. Slice the ribs individually and serve with the dipping sauce. Combine the rice wine and sugar in a small saucepan over medium low heat. Stir until the sugar dissolves and then simmer a few minutes more. Off heat, add the crushed garlic and chili pepper flakes. Let stand for 10-15 minutes and taste. If you want a bit more zing add some sambal oelek. In main course, meat, pork, thai. Bookmark the permalink.